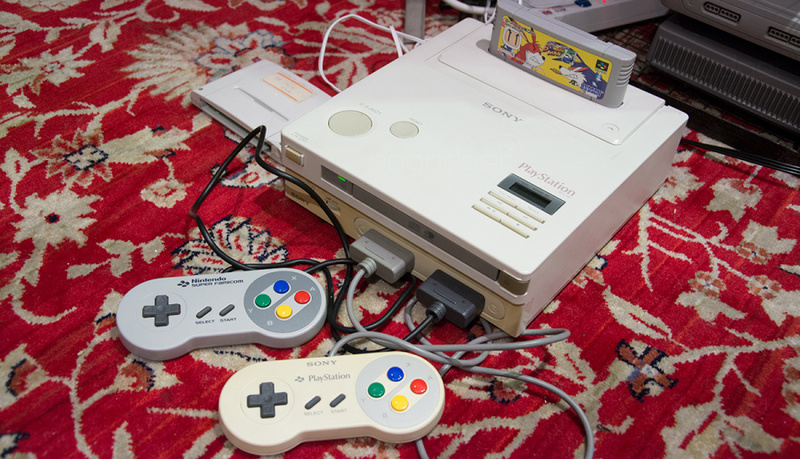 "Thanks to the haters, too"
Last week we reported on the news that the legendary SNES PlayStation has been turned on and played, proving once and for all that the system is the real deal and not an elaborate fake, as some people had claimed. Dan Diebold - son of Terry, who unwittingly purchased the system when the company he worked at went bust - has now posted a video of the moment when the console was turned on for the first time. He first thanks all the people who took interest in the console, as well as "the haters" who branded him a liar and a fraud. As you can see from the footage, the console powers on and shows the "Super Disc" screen, as well as diagnostic menus. However, the CD drive doesn't seem to be functional, although Diebold does state that he will try and fix the issue before posting another video. It's a piece of gaming history in motion. Enjoy. So, maybe there actually is no CD-ROM drive in there at all, and it's more like a shell with mostly SNES hardware in it that's just supposed to show of the general look at feel of what the system would have been like. Anytime someone feels the need to call out or address "the haters" is the moment they've completely lost me. You're not a teenage girl posting a video to your Twitter account. It's not like it's difficult to fake this, either. It's so easy to edit together an opening, then have it playing on the tv on a hidden DVD or something out of frame while pretending that the animation is legitmate, being timed up with him "turning it on". As Vandy said, when you have to "call out the haters" it makes you look 3 times as suspicious and childish as you did, before. Like a smug brat or a troll, working extra hard to make yourself look superior and like an attention grabber..And I already heavily doubted this. I still think this is fake. And this proves literally nothing. He's still a liar and a fraud in my book. The fact that the disc won't actually load anything, is a dead give away. He literally just took all this time to animate a title screen. Big whoop. Prototypes don't work this way. Either the disc reader fully works as a functional protoype, or there would be no start-up AT ALL. They better watch out. I saw the Regginator pacing the premises, and he wants the SNES Playstation back; for good, this time. He just barely missed the bid, and there's a file on that machine that will upgrade the Reginator's firmware to uncontrollable levels. I'm not talking about Reggie. I'm talking about the Reggie look-alike bot from E3, that can't drink water. I have no reason to believe this is fake, and didn't expect it to do much anyway. But it could do with some of Nintendo's stablibilty fixes! There is a picture of the chip inside this prototype and one of them showing both Sony and Nintendo name together, which isn't easy to fake it. I don't think this is fake, but sadly we won't have any confirmation ever if it's real either. My Sony playstation 1 development console is no where near as special (no nintendo references) however its good to see on the diagnostic test in the video showed NG , I have diagnostic leds on mine connected to a pcb called CON CHECK, this add-on pcb served to makes sure pads and memory cards functioned as required. The leds glow green for good connectivity and if bad a single led marked NG glows red, NG stands for Not Good/bad connectivity. To me this video proves its legitimacy as mine has the same sony dev traits. One thing that does worry me is that they will desolder some wires then find that the entire system will remarkably no longer turn on again. A common problem with these early machines is their fragile fuses, any weird charge put on the board without sufficiently discharging the board before opening will blow the main fuse, simply rectified to those that know, but a nightmare for a noob. I was expecting to see a game to be tested with the unit, instead I get 2 minutes of a guy vlogging about people who hates him and 2 minutes of a blue screen menu. Disappointing. Has Nintendo or Sony actually made a statement to say this is genuine? @PinkSpider considering specialists from engadget we're present and opened up the console and took pictures of the internals, you'd have be a very skeptical person to believe at this stage that the console is anything but legit.